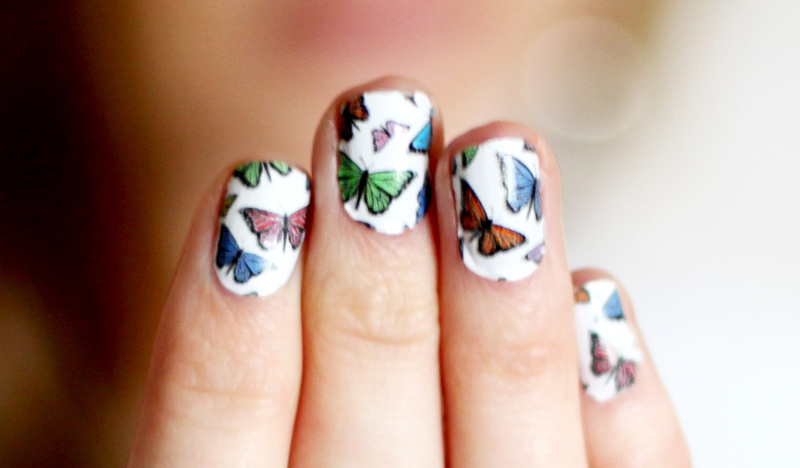 Tis the season for spring, and I'm springin' butterflies on my nailie-pies with Sally Hansen's Salon Effects real nail polish strips. They are stickers for your nails. You just peel, apply and shape in a matter of minutes. The idea is kind of genious because it makes a manicure almost fool proof. 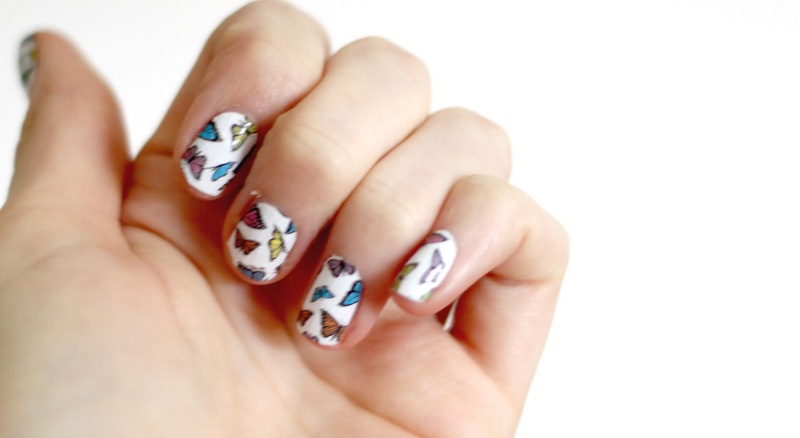 And of course, the various patterns that are offered are a fun alternative to the standard nail polish. Salon Effects cost about the same price as a bottle of OPI nail polish, however, you only get one application. It is advertised that the effect with last up to ten days. I'd say that's just about right! And they come off easily with nail polish remover. Could this possibly be the future of nail polish? I would definitely recommend trying these out for yourself and seeing just how fun they are! And trust me, everyone will ask you what is on your nails. Cute!! I just may have to give this a try! Seems pretty genious to me! I may have to try this out soon. ok, you are like my cute lil guinea pig....because I've been wondering about these! Now that you say fool proof, I might have to pick them up because I'm still trying to master the DIY manicure. p.s. the first photo of you is gorgeous! your eyes unreal! Sooo cute! I really wanna try the black lace pattern! That is so cute! I usually am not a fan of designs on nails, but I love this one! Thanks for sharing...I may have to check it out too! I want to try those!!! So cool! this might be a really good thing for me because I am AWFUL at applying nail polish. P.S. Do you think you'll ever show us your wedding pics?! cute! too bad they're that expensive for only one treatment...oh well, they're much more eye-catching I'm sure! Love the butterfly print, I have got to try those! shut the front door. i love this! So cute, they look so creative and unique, love the way your earring match them! So cute! I see these in magazines all the time but I've been hesitant to try them out because of the price tag. (Though, I'll admit, they are much cheaper than a salon manicure.) Would you recommend them? Because I've totally been eying the gold glitter. And the silver glitter. And the black/white floral. And the leopard. And the lace. CUTE!! I love the nailpolish!! I want some! I saw them at the store and they had leopard and neon colors, so fun! Just wanted to send words of encouragemen tand tell you to never stop blogging! for my sake! oh how fun!! i love the butterflies. i'll definitely be trying these out sometime! what? those are amazing. I've always wondered if those work. ive been using these and i loveee them! but make sure you dont let them sit around in the box for a while because they lose their stickiness! I loooooove butterflies! Sephora also has the same thing by OPI, called Chic Print for Nails. They're $15 though. I'll watch out for these; I prefer to pay less than $15! i want to try the leopard, but wanted to see if it was worth the $10. Gotta check them out! I keep wanting to try these and every time I'm ate the store I forgot! I need a "fool proof" manicure! i tried the zebra print and loved them, although if you have man hands like me and your nails are more wide set, then they are a little more difficult to work with. but if want a detailed design look and don't wanna go to the salon, they're worth it! I've been shocked to suddenly see these everywhere! To be honest, the patterns are probably a little much for me, but if they last as long as everyone says they do (really, over a week without chipping? Please report back if you have a similar experience), then they might be worth it. If they're as great as they sound then I hope they start making them in solid colors, because that would utterly change my nail routine. And way to rock the butterflies! LOVE THEM! And what a beautiful picture to boot! Been wanting to try these, thanks for posting! Holy Jesus! I didn't they would be that cool when I saw them in the package at Shoppers! WHHHATT. Nice. Katie, these are sooooo cool.... at first when I saw your post I thought there must be a catch, but I just applied "Girl Flower" on my nails and they are AWESOME and it was so easy. thanks!!! <3 Madison from Schlepper Chic (my blog is a new born and I don't have time to work on it until I graduate in May from UW-Madison, but follow me anyway I will not disappoint!